The yoga mat you see rolled up in this corner is the one I’ve practiced on for several years. I didn’t realize until I thought to take a shot of it in its resting place as a way to begin that it rests under the central remains of a mural that was once on a wall in my living room. 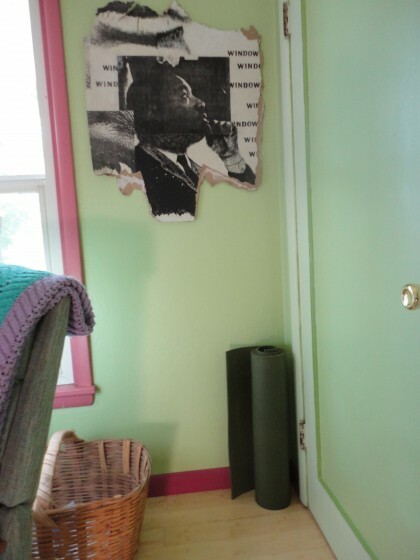 It had to be removed in order to build the masonry stove, but I wanted to save the heart of it, which is this lovely photo of Martin Luther King. So my friend doing the selective demolishing and building, carefully extracted this piece of it for me to hang on my wall. You may not be able to see it in the photo, but the words that are repeated around the figure of King are variations and fragments of the phrase “the eyes are the windows of the soul.” As I look at it all together in this snapshot, it seems a perfect corner for the mat to rest because it’s the holding place for slow, difficult, incremental change, the kind slow miracles are made of. I was practicing yoga long before there was such a thing as this nifty yoga mat, now ubiquitous in every class or yoga center. I was nineteen when I took my first class at the YWCA from a stern Causcasian man, who wore a white turban that floated over his strawberry blond beard. (I would later learn he had probably been a Sikh.) He couldn’t have been more than 10 years older than me, but I was a little scared of him. Still, it is the place where I learned the affirmation “I look back on my life with love” as I was seated on the wooden floor in a full spinal twist. At nineteen, I doubted I had much to look back on, but as the years went by, and my practice began to ebb and then flow in ways that continue to change me, I would come to glimpse the wisdom in this remarkable pairing of phrase with twist. And she was. In those days there were no yoga mats either, although I do remember the first one Judy brought to show us, laughing and calling it “yogi fly paper.” But even then they weren’t required equipment. She held her classes in her living room, furniture removed, on soft carpet. There were beach towels to spread, and old neckties as aids for stretching. She greeted everyone with a sunny smile, and it wasn’t long before I was as much in love with her as all the rest of her students. She had studied in India for extended periods with Swami Muhktananda, who she referred to simply as “her teacher.” Often she would call our attention to the present of the class as we began by saying, “as my teacher would say, the past is complete. Swimming in the infinite ocean, who is closer to the shore?” We were all invited to be present and never expected to compete—not with each other, or ourselves. In a way, Judy was my spiritual mother. She opened her heart and her home to me, listened to me when I needed it, let me stay after class and visit while she and her husband ate dinner. When I had kundalini experiences that had me flopping around or moving my hands involuntarily, she put me at a place off to the side next to her so I could have the privacy to allow whatever was going to happen to happen, and not be self-conscious or afraid. She would tell me her teacher would say “whatever happens in meditation is meditation.” And for her, and so for us, the poses themselves were a meditation. She’d also lower the lights and talk us through a guided meditation in savasana, which at bottom was the reason everyone came after a busy day at the university, or drove miles on the 405 freeway to get to her house. When I moved to Idaho, I remained in touch with her by phone. When I was diagnosed with MS, she encouraged me to keep doing whatever postures I could manage, and sent me a video tape with some modified versions specifically for people with MS. The few poses I kept up were a lifeline for me, and I’d often tell people if it were not for yoga, “I would be long dead.” Because of a bad experience at an impromptu yoga session at a conference I attended, I wasn’t comfortable with the Iyengar emphasis on form I sensed was central to the classes in this area at the time, and felt self-conscious about the limitations on balance the CP and then the MS handed me. So I practiced at home. Long before that, though, it had come to be simply a part of my life, a way to fall deep into where I needed to go to shift myself out of a fix, or a fixation, even if only for a few minutes. It had very little to do with focusing on the outward look of the pose, though of course by concentrating this way I actually did relax more fully into the correct form. There are two times that come back to me when very simple poses were transformative for me. They remind me how a very simple pose, even only one pose, one very easy pose, can be a powerful tool for shifting tension or moving out of a stuck physiological or emotional place. Both these experiences occurred before I began eating low fat and plant based entirely, and one after I was quite sick. Each provided a simple life raft in the moment that carried me to a safe shore. Before I moved to Idaho, I was what some people in my profession jokingly called “a freeway flyer.” That means I was an adjunct instructor hired to teach by the class at several institutions of higher education each semester. At one point I had a class at a community college, a couple at the University of California, and also one that took place on weekends at a private college. I literally had to fly down the freeway on Sunday mornings to get there. It was during this period that I received enough tickets for either speeding or running red lights that I was required to go to driving school or lose my license. So I sat in traffic school. I spent some additional evenings in class with young men who had DUI’s watching films about safe driving. And I drove my old Volvo through an obstacle course of safety cones. The classes I taught on the weekend were long—4 hours at a stretch. On our half-hour break, I’d find an empty courtyard on the campus, and simply go out into it and drop into a forward bend. I’d stay there for a few minutes, just letting everything we’d discussed, all the grades, all the miles and all the demands, drip from my arms and shoulders like water cascading into a deep pool. When I was upright again, my shoulders were relaxed, my legs were stretched, and I was ready to go back in and lead the class in discussion or workshop. It was my safety net—I’d bend myself in two and relax. Years after that, and after the diagnosis of MS, my son and I were invited to Thanksgiving dinner at the home of one of his friends here in Moscow. I don’t remember why now, but I was very physically uncomfortable even before going, and as can so often be the case with MS, that had translated into constipation. I ate dinner as best I could, trying to eat what I considered “healthy” but came home cramped up and barely able to move. Michael had stayed on to play with his friend and spend the night there. Once I was alone, I instinctively sunk down into the child pose on the area rug in my bedroom and stayed there for several minutes. Slowly, I felt the constriction and spasticity in my colon relax itself, and I was able to sleep. By morning, everything was “moving through” as it should. The child pose itself puts me back into the place where I am rounded into myself, calm, gestating the will to breathe, and to grow. Whatever I begin, it’s a reminder to ask the trusting child in me to curl up and gestate in each breath I take. For me, this is a literal way to be born again each day. I never get tired of starting over with its simple grace. So even when I was flying over concrete freeways at 70 plus miles an hour, too far out ahead of my own body for anybody’s good, and even years later when my nervous system had tied my digestive system up in a knotted block, these two simple poses brought me back into balance from opposite ends of the spectrum. One helped me slow down, and be my own pool at the bottom of a rushing waterfall. The other allowed me to release and “grow beyond” an involuntary lock. Though they are wonderful accessories, I didn’t need a class, a mat, a guided meditation, a video, or a stretchy pair of pants. Just the will to enter the power of the pose for a few minutes, and the grace to breath in and out while there. From time to time, as the words come to me, I’ll write more posts in an intermittent series I’ll call The Slow Miracle of My Yoga Practice. Swimming in that infinite ocean, as my teacher and her teacher would have said, there will be no prescription, instruction, or perfect end or beginning. Just waves cresting into particles of personal experience, catching light, and, I hope, reflecting it back. This is lovely! I love yoga, also – it’s very restorative, and those two poses are two of my favorite, as well! I also love tree pose, for some reason. 🙂 I look forward to reading more of this series. The two phrases, “the past is complete” and “I look back on my life with love” really stood out. Here’s to the power of peace through yoga and meditation. this is a wonderfully reflective part of your past. Thanks for sharing, I really love the past is complete phrase, and must use it myself when I get too bogged down in the past, that cannot be changed. I have dappled in a lot in yoga poses for yrs now and really love a few simple poses myself. Warrior pose and crescent moon to name a few. I too have practiced Yoga on my own for over twenty years. The stretching, holding, breathing, have helped get me through back strain, and kept me flexible. I am looking forward to your upcoming articles on Yoga, and liked this one too. Always looking forward to anything your write. If I could just sigh on this page, I would. Just the reading of your story relaxed me. Oh how beautiful, Ellen. Thank you. Beautiful! I loved the waterfall visualization, and how restorative that pose was for you. I laughed out loud at ‘yogi fly paper’! I am happily waiting to hear more as the words come for you.